I recently saw a photo a woman posted online, showing a conveyer belt full of groceries at the checkout. I didn’t think a lot of it until I saw the caption, where I learned they weren’t her groceries. They belonged to the person in front of her, and she was deriding their lack of good judgment. In the medium-sized grocery order pictured, I saw bread, eggs, cheese, grapes, and a few vegetables, which were clearly not certified organic, hormone-free, or gluten-free, depending on the item. There were also canned goods, likely filled with some sort of sodium preservative, and encased in aluminum death traps. There was a bag of potato chips. Gasp! Muffins. Who would buy muffins?! And frozen items. In short, there was a collection of food that no one in their right mind would ever pay good money for, let alone put into their body. This grocery order, she said, was the reason for the state of our country. This grocery order was a clear indication of why everyone was so overweight and unhealthy. She was appalled. But not by the selection of foodstuffs, nor by the person purchasing them, who thankfully, was only partially visible in the photograph. No, I was appalled by the person who publicly shared that photo. I could give you a dozen reasons why, but instead, I’ll condense it down to one reason that covers them all, while paying homage to my Southern upbringing. As in, my mother taught me better than to humiliate someone for something as benign as purchasing their choice of food, with their hard-earned money at a tax-paying, community-employing grocery store, whether or not I approve of such a purchase. Yet somehow, this practice is growing in acceptance and popularity. Let’s give it a name: food shaming. It’s where someone takes it upon themselves to publicly decry the ignorance of those less food-aware, or less health-conscious, by either calling it to their attention in person, or doing so behind their backs and mocking them in front of the world. 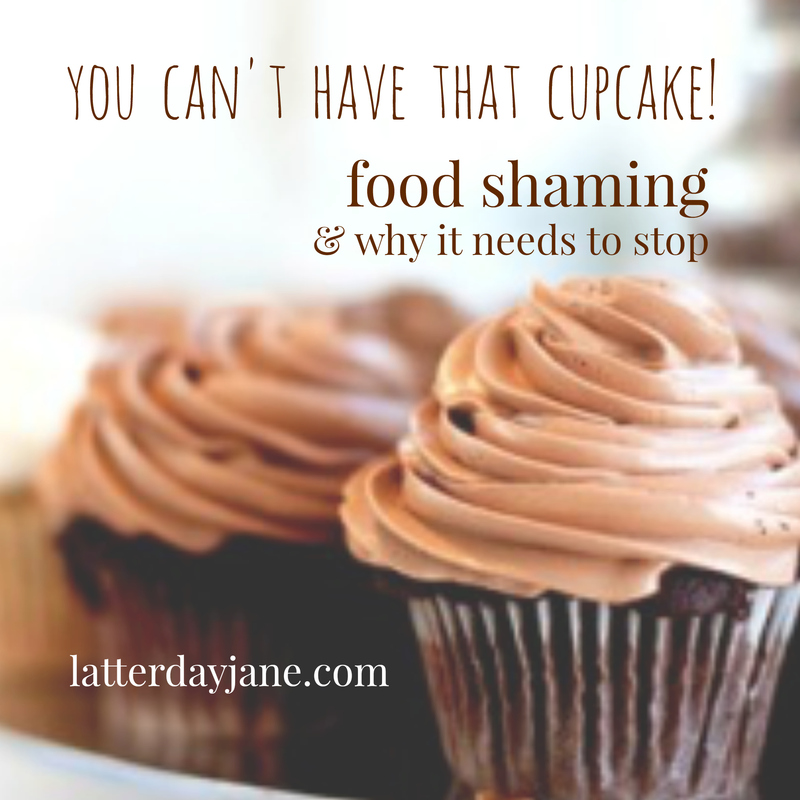 When did food shaming become okay? Actually, the question is far more simple. When did bad manners become okay? It would be outrageous to shame others for the state of their wealth, the modest homes they live in, devastating illnesses, depression, pregnancies, child-rearing choices, or a hundred other things. But for some reason, a growing number of people think it’s perfectly acceptable to direct shame at what others consume. It’s a first-world problem. There are people on this earth who do not have access to clean drinking water, let alone a dependable food supply. They would happily trade places with any one of us, regardless of the contents of our grocery carts. When I was a little girl, one of my grandfathers owned a small, country grocery. He lived in a beautiful, but modest two-story house right next door to his business. It was a few hundred yards from a much smaller home where he lived as a boy. In addition to farming the land, he was a college educated pharmacist – first in his class. He was a very intelligent man who had a good head for business. He was also gracious. If a family came into his store without enough money to buy what they needed, he’d find a way to work something out. He didn’t have the heart to send them away hungry. Alongside the farm-grown vegetables (which may or may not have suited today’s organic standards) and in-season fruits he sold, there were shelves of canned goods. There were baking staples like flour and sugar. There were meats, bacon, and eggs. There were crackers, cookies, a few kinds of candy, and bottles of Co-Cola (Southern folk liked to pronounce it with one less syllable back in those days). This business of food was a big part of their little country life in the 1940s and 50s, and remained so until the 1980s, when they closed their store. Not only did my grandparents sell this food, they ate this food. And although I was only around for the last few years in which they ran their business, I can guarantee they didn’t bring out a camera, pick up a telephone, or reach for paper to take critical note of the purchases people made. They were grateful. They were respectful. They knew what it was like to live in a time when food wasn’t always plentiful. Not all of the neighbors had everything they needed. Money was saved, choices were made carefully, and it was understood that everyone simply did they best they could. We live in a different world today, but our expectations of good manners and brotherly kindness shouldn’t be any different than our grandparents would have expected all those decades ago. In no way do I mean to whitewash the issues present in the health and food industries in the United States, and many other parts of the world. There are serious problems to be addressed. Many of us are overweight and unhealthy. Heart disease, cancer, neurological disorders, and chronic illness seem to be running rampant. We need to be asking questions about the things that go into our bodies. We have genetically modified organisms that are causing serious harm. We’re using enough pesticides, antibiotics, hormones, and all manner of artificial this-and-that to produce a crop of neon-colored corn, along with a herd of two-headed cattle to consume it. What some billion-dollar food industries are permitted to get away with is staggering. We need honesty and accountability in government and in business – including large-scale farming and food production. We need better resources and education. We need much less of a fast food culture, and much more of a home-cooked culture. We need to better moderate our appetites. But these problems will not be fixed by serving up a piping hot helping of shame to the next person in line at the grocery store. I love it when people share their experiences with food. Whether it’s a five-star anniversary dinner at a trendy spot, an all-natural juiced meal of kale with fruit (yum), or a special diet devoid of certain additives or ingredients for health reasons – Bravo! That’s absolutely fantastic. It’s also great when we spread the word about proper nutrition and health, while shedding light on some of the deplorable practices used in areas of food manufacturing and other corporate entities. We can and should sound the alarm when we feel impressed to do so. We can write letters, post pictures, and share our experiences with the good, the bad, and the yoga-mat-infused sandwich bread. This kind of awareness is important. It’s wonderful when we act as educators by sharing our personal experiences. What’s not so wonderful is being impolite to the person next in line, or striking up an “educational” conversation with the overweight stranger sitting on a nearby bench. There’s a big difference between raising awareness, and pointing the finger of shame at the men and women around us. There are villains in this world. We see them on television. We read about them in biographical accounts. Some of us might even be unfortunate enough to know one or two. But more than likely, they are not the people daring to buy potato chips and inorganic grapes. So that camera? Put it down. It would be a far more productive use of time to pick up a cupcake — gluten-free, if you must. Sarah Elizabeth enjoys being a wife and mother. A graduate of Brigham Young University, she resides in a small Southern town filled with rolling green hills and hospitable people. She once enjoyed a life with a slightly faster pace as an award-winning television journalist, and marketing professional, but these days, her life is much more quiet. She writes about her experiences with Inflammatory Bowel Disease, chronic illness, and her love of Jane Austen, among other things. Latter-day Jane is her blog. Click here to follow her on Facebook. Categories: Uncategorized | Tags: additives, antibiotics, cupcake, food, food shaming, foodie, GMO, grocery, hormones, organic, recipe | Permalink. Your example illustrates the point perfectly! I’m sorry that happened! Southern fried manners indeed — I bet we both know a few mommas who would be happy to help teach the course.